The CAN-Engine™ (CANE) is a high performance, low cost, C/C++ programmable embedded controller with CAN support. It is intended for networking, automotive, industrial process control, high-speed data acquisition, and especially ideal for OEM applications. A Controller Area Network (CAN) controller (SJA1000, 20 MHz clock) can be installed along with on-board CAN transceiver. Supported baud rates range from 300 bps to 1 Mbps, and interrupt-driven buffering software allows reliable, efficient delivery and receipt of packets over the CAN network. CAN control egisters on the SJA1000 are accessible in software. A Fast Ethernet Module can also be installed to provide 100M BaseT network connectivity. 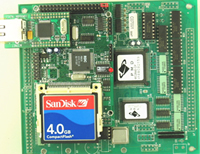 This Ethernet module has a hardware LSI TCP/IP stack. It implements TCP/IP, UDP, ICMP and ARP in hardware, supporting internet protocol DLC and MAC. The hardware Ethernet module releases internet connectivity and protocol processing from the host processor, which represents a huge improvement over software-based TCP/IP stacks. The resulting system can easily handle transmissions in the 100KB/s+ range in real world applications. It supports 4 independent stack connections simultaneously at a 4Mbps protocol processing speed. Software libraries and demo project are available for Ethernet connectivity. A 16-bit parallel ADC (AD7655, 0-5V) supports ultra high-speed (1 MHz conversion rate) analog signal acquisition. The AD7655 contains two low noise, high bandwidth track-and-hold amplifiers that allow simultaneous sampling on two channels. Each track-and hold amplifier has a multiplexer in front to provide a total of 4 channels analog inputs. The 16-bit parallel ADC requires only two CPU I/O operations (one start, one read) to complete a 16-bit ADC reading. With on-board precision 2.5V reference, the ADC accepts 0-5V analog inputs at 16-bit resolution of 0-65,535. Two 12-bit DACs provide 0-4.095V analog voltage outputs capable of sinking or source upto 5mA. The CANE supports up to 2 GB mass storage CompactFlash cards with Windows compatible FAT filesystem support, allowing user easily transfer large amounts of data to or from a PC. The CANE features fast execution times through 16-bit ACTF Flash (256 KW) and battery-backed SRAM (256 KW). It also includes 3 timers, PWMs, 20+ PIOs, 512-byte serial EEPROM, two RS232 ports, 3 timer/counters, and a watchdog timer. The three 16-bit timers can be used to count or time external events, up to 10 MHz, or to generate non-repetitive or variable-duty-cycle waveforms as PWM outputs. The PIO pins are multifunctional and user programmable. A real time clock (DS1337, Dallas) is available. The CANE can be powered by regulated 5V DC or unregulated 9-12V DC with installing a 5V regulator. The CANE works with TERN expansion boards including the P52, P100 and MotionC.